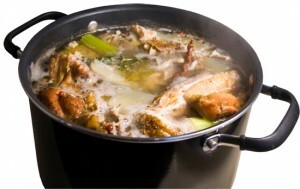 Separate bones into several pieces and place all remaining ingredients in large stock pot, Dutch oven or slow cooker. Fill with cold filtered water. This is important; starting with cold water is essential. As the water warms up, the fibers start to release all their flavors and let’s face it, it is all about the flavor, right! The vinegar will help impart the vitamins and minerals. Set on medium-high and bring to a low boil. Remove any scum that forms on the surface (this scum will take away from all that flavor). Cover and reduce to a low simmer for 6-24 hours. Longer equals more flavor and nutrition. Let cool and strain with fine mesh strainer. Compost the vegetable scraps, the bones can be frozen and used again later. Refrigerate and remove any hardened fat on top. You know if have a good batch if it congeals like Jello! Use in 3 days or put in pint or quart jars, bags, containers and freeze, then use for future recipes. Sea salt to taste afterwards. Before our culture became the fast food nation that buys everything boneless and in a neat package, people got their meat from a butcher who sold it to them on the bone. Our thrifty ancestors used every part of the animal and especially the bones. In some villages, the bone would be passed from house to house every night to be put into the family’s soup pot until it was used up. People would make broth and stock out of the bones to use to make other meals or to flavor their whole grains. Meat and fish stocks are used traditionally in almost every culture in the world. However, they have almost entirely disappeared from our modern American family kitchen as all of our food has become so processed and “fast.” This is really a shame because it is so delicious, very easy to make and has incredible health benefits. Bone broth is very easy to make. It takes time to cook it, but you can make a lot of it at one time and freeze it for use as a base for soups, stews and whole grains; or just consume it by itself for a quick and healthy snack or meal. The main components of bone broth are cartilage, bone marrow, amino acids, collagen and gelatin, and minerals. Cartilage is formed from collagen and elastin proteins and contains glycosaminoglycans (GAGs), chondroitin sulfate, keratin sulfate and hyaluronic acid. It can be used to treat arthritis, degenerative joint disease, inflammatory bowel disease and will boost your immune system. You have probably heard of the supplement Glucosamine Chondroitin. Lots of people take it to alleviate joint pain. Usually the pill is made up of about three of the most common types of glucosamines. However, there are over 100 kinds that exist in natural cartilage and when you make bone broth, these are released and you get the extra benefits of these (especially when you use knuckles, feet and ribs to make your broth). Bone marrow is an important source of immune support factors and nutrition in the bone broth. 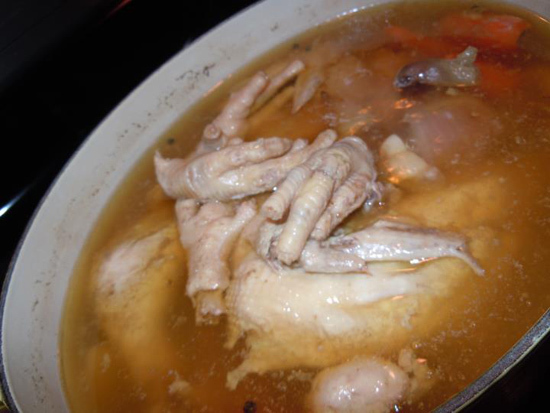 There is research that suggests that it boosts immunity and reduces inflammation; so there may be something to the legend of Grandma’s cure-all chicken soup, after all! Glycine and Proline are amino acids that are present in traditionally-made bone broth. Glycine is an amino acid that is essential for the production of other amino acids. Proline is an amino acid that is used in the structure of collagen (essential for firm skin, ladies!) as well as for bones, ligaments, skin and cartilage. Collagen makes up about 25% of the protein in the body. There are fifteen types of it. It is the same as gelatin. Gelatin usually refers to extracted collagen. Collagen is what it is called when in the bodily form. Most processed commercial gelatin is made from animal skin and contains MSG. But homemade bone broth has a much more nutritious (and delicious!) gelatin that has lots of different minerals and amino acids. The biggest benefits from collagen and gelatin are its soft tissue and wound healing properties. It also aids in healing cartilage and bones. Basically, what’s inside and around the bones heals our bones and tissues. You have probably also heard how our modern foods are insufficient in minerals due to our depleted soils. Never fear! Real bone broth is here! Bone broth is an excellent source of calcium and phosphorus. It also contains magnesium, sodium, fluoride, sulfate and potassium. So, no need to run out and buy those expensive bottles of trace minerals if you are consuming your traditional bone broth. This article is contributed by Hans Taub, a life long friend of the Urban Homemaker who is currently pursuing his Nutritional Therapist Certification with the Nutritional Therapy Association; a holistic nutrition program promoting a diet of nutrient-dense whole foods that are properly prepared. 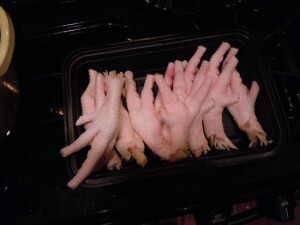 Does one have to “peel” the chicken’s feet? No, you do not have to peel! 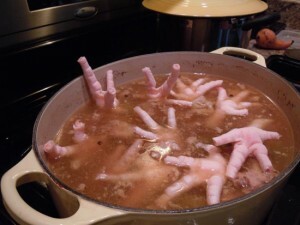 When I make bone broth I’ll add chicken feet that I have saved for the purpose. I normally peel them because there usually is some dirt between the scales on the knuckles. It is easier to peel, than clean between those tight spaces(sometimes I scald to help the peeling process). If they are clean then I don’t peel. Can I cook my turkey, refrigerate or freeze my bones, and make the broth at a later time?? Couldn’t get into the feet part, but 1 month ago now, my step-dad ended up in the hospital with edema and infections in his legs. Doctors said he had to loose weight! no questions. I started making the turkey soup (he thinks it’s chicken) with fresh vegetables and brown rice. He started at 263lbs. Today, he weighed himself and he’s now 244lbs! No more canned soup for him and he loves my soup. Yes! Economical, nutritious – amazing! Top-of-the-line Quality Products that we use and recommend ourselves.